Wondering what else to do with the Avocado-Cumin Mayonnaise recipe I shared in the last publication Creamy Avocado-Cumin Mayonnaise? Spruce up your plain deviled eggs with the addition of this mayo and watch your family's smiling faces. My 5 year old Bronwyn, happens to love deviled eggs, and she also loved these. I took this as a great sign, in all her persnickity ways. This being the child that I have bickered with for putting the mustard on her hotdog before adding the ketchup, or cutting her sandwiches into rectangles, as opposed to triangles. Further still, we have had tiffs about placing her beverages into a blue, when she feels like orange plastic cups that day, not to mention giving her 10 grapes instead of 8, YEAH! We all have our little nuances though. I am just glad that I can put a check mark on the 'GO MOM' side of the board. Thank God for those small miracles and a glass of wine every now and then! 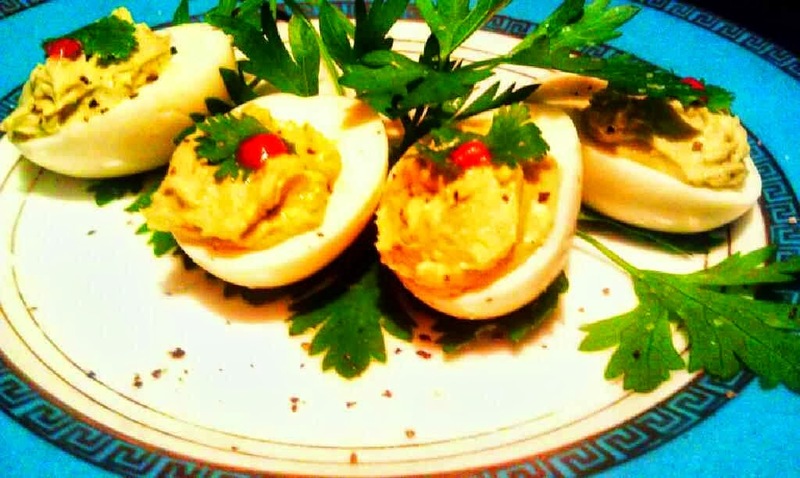 Just follow your favorite deviled egg recipe substituting in this mayo. For this particular above recipe, I omitted the relish and the mustard for my more savory flavor profile tasters. I also have a version with the relish and mustard, whichs lends the element of sweet/tart. Bronwyn liked both, but preferred the ones with relish. *Just in case this is your first time, here is my complete recipe! Place eggs in medium pot with tightly fitting lid and fill with lightly salted COLD water until just covered. Over medium high heat UNCOVERED, bring up to a boil, then cover with lid and REMOVE from heat source. After 15 minutes, drain and peel eggs under cool running water. Halve each egg and gently press on sides to remove yolk into a medium bowl. Pipe or spoon into egg halves liberally and garnish with a cilantro leaf and a dot of Sriracha. Happy Mothers Days Year Round! Upside Down Tropical Pork Pot Pies! Warm Asian Slaw and a Cool Picture!